﻿ Cristiano Ronaldo: "I want to win La Liga. It's our priority"
26.10.2011 » Cristiano Ronaldo: "I want to win La Liga. It's our priority"
Cristiano Ronaldo has his priorites well set in what concerns the big trophies this season. A few days ago, the Portuguese attended Castrol Edge "premiere", for his own documentary film "Tested to the Limit", where he granted a few statements. CR7 confessed that the Spanish League "La Liga", is currently regarded with an higher priority level, when compared to the others competitions, including the UEFA Champions League. Earlier this week, Cristiano Ronaldo attended his own film documentary "premiere", "Tested to the limit", released by Castrol Edge. The Real Madrid player was approached by journalists, as it is usual and made a note on what are his and the club's priorities for 2011-2012. Ronaldo is aiming at the Spanish "La Liga", and despite relegating the UEFA Champions League almost to a secondary level, he still says Real Madrid will fight for every title this season. Cristiano Ronaldo: "I want to win the Spanish League "La Liga". I also believe that's what the club most wants at this stage. But obviously that we'll remain interested in winning the UEFA Champions League if we have a chance for doing that." Ronaldo then added: "Real Madrid is one of the best clubs in the World, so we have to think about winning all the competitions we're playing at. We are going to give our best and we'll also try to win the Champions League." Cristiano Ronaldo has recently returned to his best form, after scoring his 3rd hat-trick in the current season and the 11th of his Real Madrid journey. Apart from that fact, Ronaldo has also scored a total of 65 goals (53 goals in 2010/2011 and 12 on the on-going 2011/12 campaign) in official games, since José Mourinho took control of Real Madrid, in the beginning of the 2010-2011 season. These stats put Ronaldo on the verge of becoming the highest goalscorer under the guidance of José Mourinho, since the current leader of that list remains being Chelsea's Didier Drogba, with 66 goals. Real Madrid will take Villarreal this Wednesday and Cristiano Ronaldo can probably start preparing to beat another record. FIFA's and France Football merged award for the "FIFA World Player of the Year (2011)", will be decided next January, in the beginning of 2012. However, some media have already started talking about who the candidates most likely to be on that shortlist. Recent news published by Spanish newspapers have already come up with preliminary lists, which not surprisingly, include Cristiano Ronaldo's name as one of the contenders. It's also said that Real Madrid will have a total of 5 players nominated and Barcelona a total of 10 players. FIFA and the French magazine "France Football" will reveal the 23 names list in the 1st of November, while in the 5th of December, that list will be cut to the final 3 contenders. The winner of the FIFA World Player of the Year 2012, will be announced on the January 9th. On a side note, Cristiano Ronaldo has recently extended his marketing efforts to the Asian continent, targeting China with a special interest. 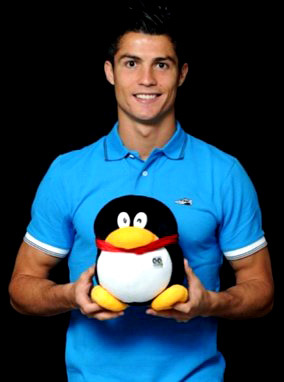 Ronaldo opened a profile account in a popular social network called "Tencent QQ", one of the few allowed by the Chinese government. Similarly to what happened with Cristiano Ronaldo's popularity phenomenon on Facebook, many thousands of fans rushed to be "linked" with the Portuguese star and in less than 10 days, Ronaldo has already more than 1 million followers. "Tencent QQ" has an impressive number of 230 million users, a bit less than Facebook, which is said to have to close to 750 million active users. However, Cristiano Ronaldo isn't the first player to invest in the Chinese market, since Lionel Messi already created an account back in 2010 (before the South Africa World Cup) and currently counts with more than 13 million fans. The most popular personalities on "Tencent QQ" are He Jiong (TV host and actor) with close to 23,9 million fans and the Chinese athlete, Liu Xiang (110 meter runner), with near 23,8 million followers. Real Madrid will face Villarreal this Wednesday, for La Liga. You may watch Real Madrid vs Villarreal free, in our Football Live Streams section. The countdown clock timer, displaying the time left for the next Ronaldo game, is shown on the top right corner of all pages. Besides that game, you can also follow the English Premier League next Saturday and watch Everton vs Manchester United live. In a La Liga fixture, you may watch Barcelona vs Mallorca streaming. All streamings are provided from our "Live" section.